It is at the cru bourgeois level that we need to direct our attention. Forget the pretensions of the first growths and super-seconds. Moreover you can also drink the lesser growths sooner. The last vintage of Léoville-LasCases I bought was the 1990. I’ve only just stopped purchases of wines at the Ormes de Pez level (my approaching old age comes into it). This is where we are at the moment. You will have heard of crus bourgeois exceptionnels. Forget the concept; it doesn’t exist any more. Moreover, the vast majority of the estates that would be considered an exceptionnel have departed from the field; they are no longer members of the Association of Crus Bourgeois at all, so could not be considered even if the idea were to be resurrected. At the moment there is but one category, that of simple,rock-bottom cru bourgeois. It is all absurd. 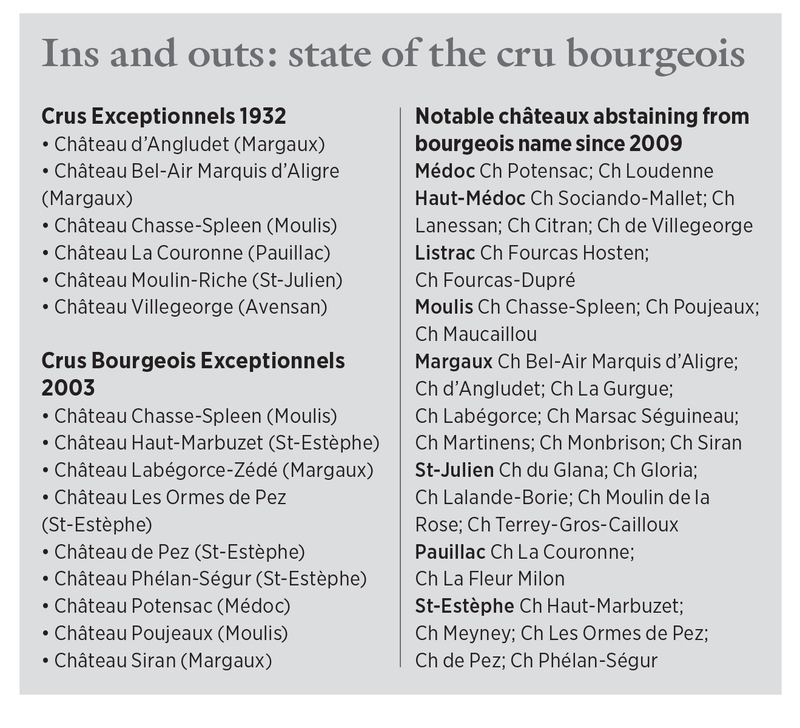 There have always been crus bourgeois wines, back since wines were first unofficially classified in brokers’ notebooks around the time of the French Revolution. In the 1930s, a classification of the bourgeois growths made it all ‘official’ (see box), and was an attempt to stir up some enthusiasm for the wines at a time of economic privation. This list named six exceptionnels, 97 supérieurs and 387 simple bourgeois. The inference was that, come a revision of the list of crus of 1855, the exceptionnels would be prime candidates for upgrading. Thankfully this last piece of nonsense was revoked in 2009. Since then, those properties that wish to be considered bourgeois can apply for recognition. But this is the sole category. As you will see in the accompanying list (see box left) most of the best – indeed practically all the best – have expressed no interest whatsoever.